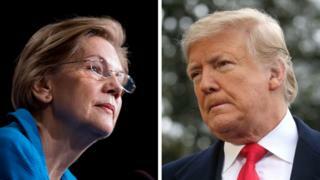 US President Donald Trump is facing criticism once again for taunting Democrat Elizabeth Warren over her purported Native American heritage. 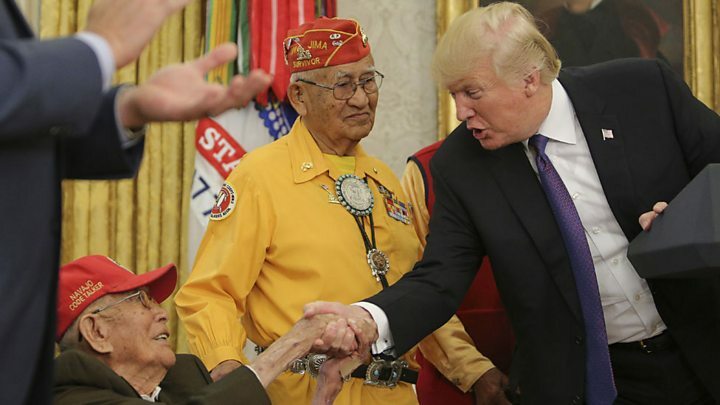 On Sunday, Mr Trump said the senator, a 2020 presidential hopeful, should have filmed a commercial “from Bighorn or Wounded Knee” in “full Indian garb”. Wounded Knee was one of the worst native massacres in US history. Native Americans have decried Mr Trump’s language, calling it insensitive and racist. Mr Trump’s barb was a response to an Instagram live by Ms Warren on New Year’s Eve, just after she announced she was running for president. To whom does Wounded Knee belong? Ruth Hopkins, a Sioux writer and tribal attorney, said the president’s jibe was “cold, callous and just plain racist”. Another said she was “angry and sickened” by the president’s tweet. Wounded Knee survivors, Dewey Beard, left and James Pipe-on-Head, right, meet John Collier in Washington D.C., 1938. The government (Bureau of Indian Affairs) offered to pay $1,000 to each person who survived the massacre. Some of Mr Trump’s supporters, however, insisted the president was just joking; others pushed back against the idea that the language was racist at all. At the battle of Little Bighorn in 1876, Lakota Sioux, Northern Cheyenne and Arapaho tribes fought against US cavalry led by Lt Colonel George Custer, leaving hundreds dead, including the colonel. At Wounded Knee in 1890, as many as 400 unarmed men, women and children were killed by US soldiers. Congress formally apologised to the victims 100 years later, expressing “deep regret” for the massacre. The president has been censured repeatedly for his Native American jabs at Ms Warren. He has nicknamed the Massachusetts senator “Pocahontas” – who was the daughter of a 17th century indigenous chief – and used the name to mock her even in front of Native American veterans. Ms Warren has also dealt with backlash of her own from tribes, after revealing DNA test results she said validated her claim of Native American heritage. The Cherokee Nation responded saying using a test to claim any tribal connection was “inappropriate”. The senator has not claimed to be a citizen of any tribal nation and said she respected the distinction between DNA and tribal affiliation, but the president was quick to taunt her over the test. Since 2012, Ms Warren has also denied benefiting from her reported Native American background, when it emerged that she was listed as a minority in a Harvard Law School directory.